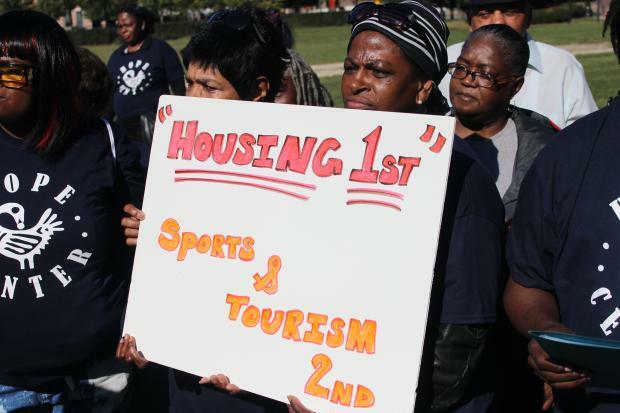 BRONZEVILLE — Public housing advocates joined a group of public housing residents Thursday at the site of the former Harold Ickes Homes complex in asking the Chicago Housing Authority to keep a promise it made to them. "We were told by the CHA that once the Ickes was torn down replacement units would then be built," said Loretta Hendricks, 54, who said she first moved into the Ickes in 1968. "That has not happened even though taxpayers' money is being used to help build a new Green Line station on 22nd Street and a new stadium for DePaul." However, Matt Aguiler, a spokesman for the CHA, told DNAinfo.com Chicago that plans were being made to build replacement units. "The agency plans to bring back mixed-income housing, including public housing units, on remaining portions of the Ickes site," Aguiler said. Aguiler said the CHA aimed to seek a developer in 2014 to work with agency to create a project that could also include commercial, institutional and recreational components. Future projects by the CHA are detailed in the agency's Moving to Work Annual Plan for fiscal year 2014. Public housing advocates are also urging residents to contact the CHA by 5 p.m. Friday to register their concerns during the agency's 30-day public comment period. The Ickes Homes was comprised of 11 buildings at 2326 S. Dearborn St. before the last family moved out in 2010, according to the CHA. A vacant lot is all that remains of the complex, which many former residents said was their home. "I lived in the Ickes for 30 years. Everyone was like family to me and I just want to come home," said Dorothy Jennings. Christopher Curtis, 42, struggled to find words to describe how he felt about leaving the Ickes after living there 20 years. "I now live in Legends South, which replaced the Robert Taylor Homes, and I don't like it over there," said Curtis. "There's too much shooting. When I lived at the Ickes, it was safe for me to walk down the street or be outside at night. I can't do that anymore." In August, the Chicago Transit Authority announced plans to build a Green Line station across the street from the Ickes site. Mayor Rahm Emanuel said the new station would give conventioneers at nearby McCormick Place a new and less expensive way to get around the city. The $50 million station on Cermak Road replaced one that was demolished in 1977. Plans are also being made to build a new arena at McCormick Place for DePaul University. The convention complex is three blocks away from the Ickes site and Emanuel said the city would pay $33 million for land acquisition with Tax Increment Financing funds. DePaul and the Metropolitan Pier and Exposition Authority would split $140 million in construction costs. In addition to basketball games, the new arena would also be used for midsize conventions, concerts and Chicago Public Schools events, such as graduations, Emanuel said. With millions of dollars being spent on these projects by the city, Rod Wilson, executive director of the Lugenia Burns Hope Center, said he could not understand why the city wouldn't help do the same for public housing. "The city seems to be able to find money for these projects but when it comes to public housing they claim to be broke," Wilson said. "We need housing first and sports second." The relocation of Ickes residents has also had an effect on local churches. Mt. Carmel Missionary Baptist Church, 2976 S. Wabash Ave., lost 125 members, said the Rev. Robert Jones Jr.
"My church was in walking distance for the residents. A lot of them would walk over on Sundays for service," recalled Jones. "I am calling on the city and the CHA to keep its promise to residents and rebuild the community that once stood here." The Rev. Jimmy Hodges, pastor of New Covenant Gospel Tabernacle at 4035 S. Michigan Ave., said he also saw his membership decline. "I lost about 200 members when the Ickes was closed. It's a shame the CHA [would] rather send people to go live in neighborhoods where they will get shot instead of bringing them back to where they feel safe," Hodges said.